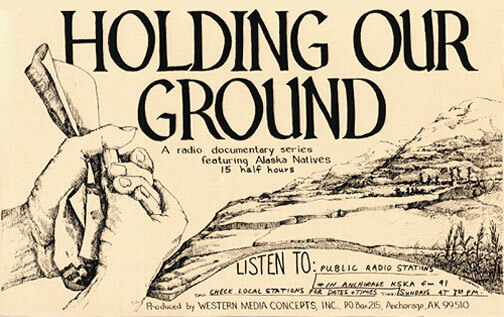 "HOLDING OUR GROUND" is a 15-part series of half-hour radio documentaries which features the voices of Alaska Natives as they struggle for more control over their lives. Land, subsistence. and sovereignty are the main themes that weave the people and their cultures together in a timeless continuum that is now threatened. These programs were aired during the fall of 1985. Western Media's executive producer, Jim Sykes, originally recorded the hearings of the Alaska Native Review Commission, (ANRC), on location in Alaska's remote villages. ANRC Commissioner, Canadian Judge Thomas R. Berger traveled throughout Alaska to find out how the people feel about their most basic values and the effects on them by the Alaska Native Claims Settlement Act (ANCSA) of 1971. The result is Berger's book, Village Journey, and this radio series, "Holding Our Ground.'' Both reveal a compelling grassroots political movement which will have far-reaching consequences in Alaska and around the world. Sykes relies on the people telling their own stories to Judge Berger as the foundation for the programs, interspersed with update interviews and "expert" explanation when needed. Village people give compelling and eloquent testimony, sometimes in their own languages, about practical and spiritual matters. Taken separately each segment provides a glimpse into the various aspects of Native society affected by ANCSA. Taken together, "Holding Our Ground'' presents an overview of these vital issues by the people themselves. Sykes was assisted by writer Jeff Berliner, researcher Sue Burrus, production assistant Gary Peterson, narrator Adeline Raboff, and several other Natives doing voice-overs. Uplinks of the series over the Alaska Public Radio Network satellite began in September . Indications are that all of Alaska's 15 public stations carried the series. Several commercial stations covered areas not served by the public network (Seward Peninsula and some of Interior Alaska). The programs also are being made available to all public and some commercial stations in the lower 48 and Canada. "Holding Our Ground" has great potential for educators to use alone or in conjunction with other curriculum materials. Comprehensive 30-minute survey of the burning issues facing Alaska's Native community in the second half of this decade. This tour over the vast landscape of Alaska Native affairs serves as an overview of the topics to be treated in depth during the other 14 segments. The ages-old Native feeling about the land comes across the airwaves like a fresh breeze. Two starkly different realities are presented—the Native concept of oneness with the land and the Western notion of land ownership and development. How do these contrasting philosophies fit the Native in rural Alaska? Far from the political and legal controversies surrounding subsistence, Natives carry on their traditional subsistence lifestyles. Hear their very personal descriptions of subsistence, what it is, and what it means to them. An important aspect of this documentary will be to delve into the mix of subsistence and cash economies. Self-determination is the heart of a rising grassroots political movement. The listener will learn that this quest by Native people to control their own futures reaches far into the past. And the listener will discover that American political theory is not as much at odds with the sovereignty movement as one might think. Who calls the shots in the Native community: A look at power, history, and decision making. The audience will consider change from the perspectives of traditional village rule to government and corporate bureaucracies. Traditional Native lands became corporate assets because the Alaska Native Claims Settlement Act created profit-making Native corporations to hold the land. This segment will look at one of the toughest questions facing the Native community today: "Do these Native corporations have an obligation to develop their lands to earn a profit for their shareholders, or do they have an obligation to preserve those lands for subsistence and for generations to come?" Land owned by Native corporations can be lost through sales, corporate takeover, bankruptcy, or taxation. This has generated so much concern among Natives trying to save their land that there are now a number of options to prevent loss of these lands. This program is an exploration of the major risks and what alternatives are available. Carrying on the subsistence lifestyle without interference from the law is a thing of the past. Traditional ways of hunting fishing, and gathering are now subject to political and legal changes and challenges in what may well be Alaska's most bitter controversy. Hear discussion of the new role of Alaska Natives as treaty-makers and game managers. Local government control is a reality in some areas of Native Alaska. In other areas Natives are working to implement their own unique forms of self- government. Some have found self-determination in traditional government. Take a close look at the communities where sovereignty is becoming a reality. When the Alaska Native Claims Settlement Act. passed on December 18, 1971, all those yet to be born were left out. Now thousands of teenagers and toddlers alike are on the outside of ANCSA looking in. The Native community is divided into ANCSA shareholders and newborns, and the problems could get worse. Natives young and old speak out in eloquent terms. Nearly every Native organization in the state is jumping on the "Let's do something about ANCSA" idea. What began as grassroots dissatisfaction with the act has now shifted into a well-organized movement. There is the Inuit Circumpolar Conference, the United Tribes of Alaska, the Alaska Federation of Natives, and Association of Village Council Presidents, and others. An historic journey by Canadian Judge Thomas R. Berger has culminated in some provocative recommendations about the options open to Alaska's Natives. Listeners will hear a cross-section of views about what Berger reported and how this may affect changes in the Alaska Native Claims Settlement Act. The Alaska Native Claims Settlement Act inspired other indigenous peoples in the world to seek land claims in the settlements with their countries. This program will look at those efforts in Canada, Greenland, Australia, Norway, and elsewhere. Now some of the land claims proposals of others are being studied by Alaskans seeking to improve ANCSA. The final segment considers what people wanted all along in land claims and what they got. Should all the hard work of the past be scrapped? How has the dream changed? Voices of many people speak of the future, what they want and how they will go about getting it for themselves and their Children.